The Clarion-Ledger was founded in 1837 in Paulding, Jasper County. Known initially as the Eastern Clarion, the paper was sold later that year and moved to Meridian. After the Civil War, the paper moved to Jackson, merged with the Standard, and became known as the Clarion. Owners Col. J. L. Power and Col. Robert H. Henry renamed the paper the Daily Clarion-Ledger after combining it with the State Ledger (printed in Brookhaven and Newton) in 1888. The company is listed as the second-oldest corporation in Mississippi. Henry was a member of the Hederman family, and when he retired in 1912, other family members began managing the paper. 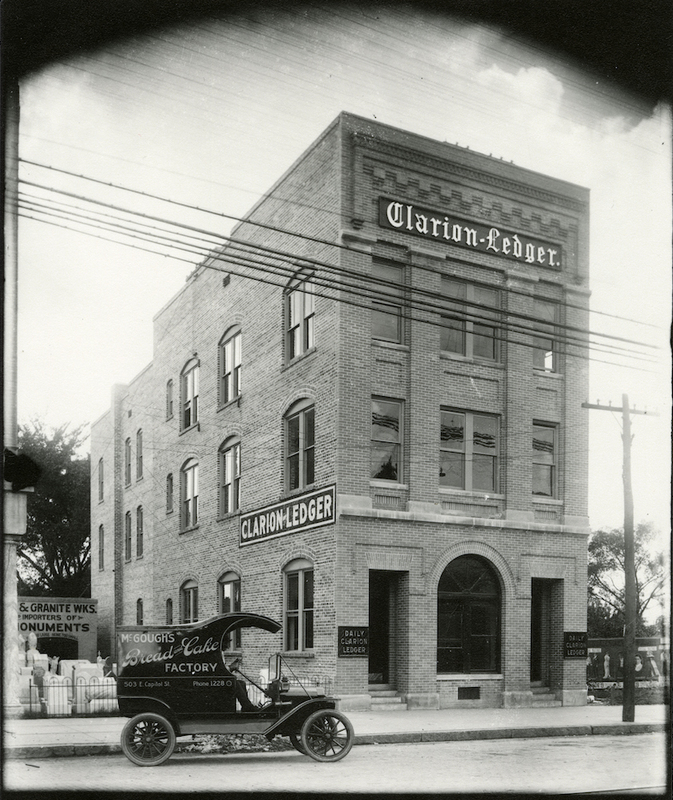 Scott County printers Robert M. “Bert” Hederman (1877–1944) and Thomas M. Hederman (1878–1948) acquired control of the Clarion-Ledger in 1922. Bert Hederman took over the printing business that Henry had started, while Tom Hederman became the paper’s business manager and editor. In 1954 Robert M. Hederman Jr. (1910–96) and Thomas M. Hederman Jr. (1911–85) acquired the Jackson Daily News (an afternoon paper founded in 1892) and merged its printing plant with that of the Clarion-Ledger. On 1 April 1982 the Hederman family sold the morning Jackson Clarion-Ledger, the afternoon Jackson Daily News, the Hattiesburg American, and six weeklies to Gannett for $110 million. The Clarion-Ledger had a circulation of 66,620, mostly in the communities surrounding the state capital. The Daily News had a circulation of 40,147. Gannett consolidated the two Jackson newspapers in 1989. Over the next decade Gannett launched a multistep expansion that included moving the newspaper from 311 East Pearl Street to 201 South Congress Street in 1996. Other changes included acquiring the Hederman Brothers printing building in 1993, adding a second press line in 1995 (expanding from eight units to fifteen units and providing the capability to print up to sixty thousand papers per hour), and the renovation on the west side of the building, which houses circulation and production facilities. Prior to 1970 the Clarion-Ledger and the other Hederman papers were known for their racist politics, promoting segregation and supporting the efforts of the Mississippi State Sovereignty Commission, a quasi-secret government agency. Rea Hederman became the Clarion-Ledger’s editor in 1970 and made dramatic changes in the newspaper’s tone. It subsequently won numerous national prizes, including a 1979 Heywood Broun Award and the Robert F. Kennedy Memorial Award, a National Education Reporting Award, and a George Polk Award, all in 1981. The newspaper also won the Pulitzer Prize for Public Service in 1983 for its robust coverage of the dire state of public education in Mississippi and the marathon legislative initiative that led to the adoption of the 1982 Education Improvement Act. Distributed throughout the state, the Clarion-Ledger has the largest circulation in Mississippi. However, like most other newspapers, its circulation has dropped in recent years, falling to about sixty thousand by the 2010s.